Nextbit launched the phone robin with the main highlight: Never Run Out Of The Space is now shutting down its smart storage cloud service.Smart Storage was a major feature of Nextbit OS that allowed the Robin devices to expand local storage by syncing apps, photos, and other content to their cloud. 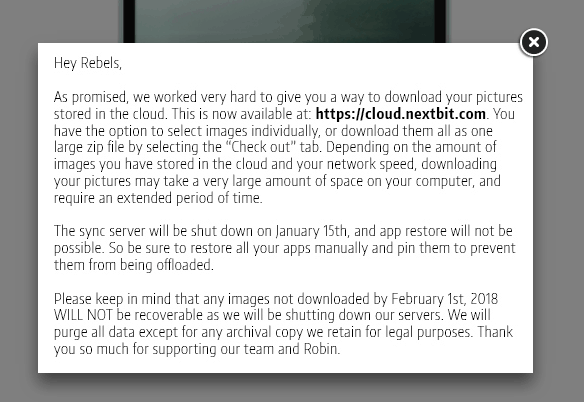 Now the company is planning to shut down the smart storage cloud service on 1 March.Nextbit emailed users in which they said” from March 1st all Robin phone owners would be signed out of Smart Storage, users need to retrieve their all their data latest by 1 April by visiting cloud.nextbit.com after that all personal information and data of the robin device owners will be deleted completely. When a user visits Nextbit website there is a Pop-up stating that the app restoration will not be possible on or after 15 January as their syncing server will be shut down on 15 January, and images not downloaded by 1 February 2018 will also not be recoverable. The pop up on the website says the syncing server will be shut down on 15 January and the images will be inaccessible after 1 February 2018 there is a confusion regarding dates but one message is clear that: This is the right time to back up your data or you will lose it completely.